The flag of the small municipality of Monte das Gameleiras, State of Rio Grande do Norte, Brazil, 5,746 inhabitants, is red with a centred blue cross edged in white, with the municipal arms centred on a white lozenge. religious communities in the Middle Ages. The municipal symbols are prescribed in Article 3 of the Municipal Constitution, adopted in March 1996, as "the flag, the coat of arms and the anthem". 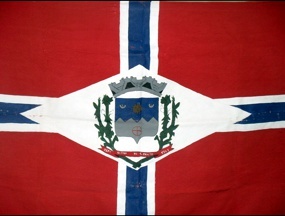 The flag of Serra de São Bento is red with a blue cross fimbriated white. In the middle is placed a blue lozenge charged with the municipal coat of arms. The coat of arms in today's use is slightly different from the one represented on the flag, differing mostly by the depiction of the mural crown and of the plants that support the shield.